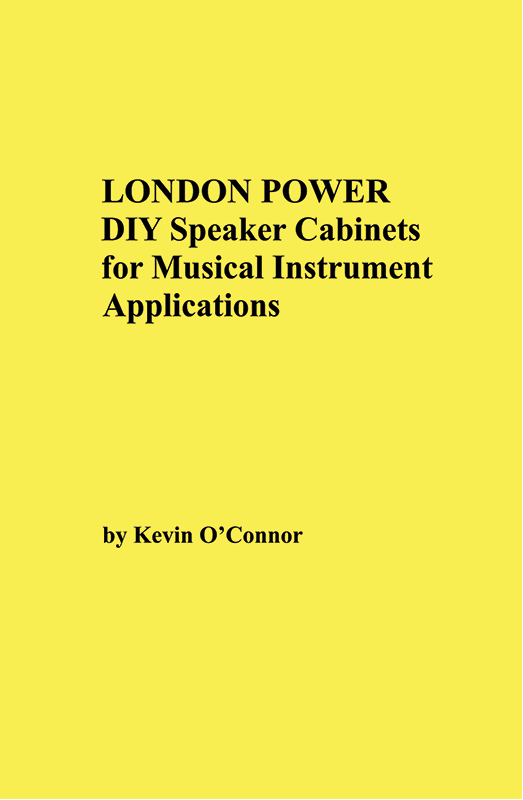 London Power DIY Speaker Cabinets for Musical Instrument Applications. Speaker cabinet design is mysterious to most people, but it doesn't have to be - especially when it comes to speakers for musical instruments. Cabinet evolution is described culminating in Kevin's own designs built by London Power, based on 20+ years of experience and input from expert speaker designers. Resonant and non-resonant cabinets are explored, along with the choice for building materials, finishes, woodworking techniques, installing grill cloth, and the use of wheels and handles. Driver selection and mixing is detailed, covering driver impedance, power ratings and wiring. Dare to design bad tone right out of your life. Spiral bound, 77 pages, 1 lb, 5.5" x 8.5". Packaging Dimensions 8.4 in. x 5.9 in. x 0.5 in. 1 answers Does this book contain how to dovetail or finger joint cabinet making? If yes i will soon get one. Yes, those topics are covered in this book.